Καλοτοποθετημένο στη ψώνια, εστιατόρια, νυχτερινή διασκέδαση περιοχή της Μπανγκόκ πόλης, το Lamurr Sukhumvit 41 Hostel είναι το κατάλληλο μέρος για να χαλαρώσετε από τις πολυάσχολες μέρες σας. Από εδώ, οι επισκέπτες μπορούν να έχουν άμεση πρόσβαση σε όλα όσα η πόλη έχει να προσφέρει. Από τη βολική της τοποθεσία, η ιδιοκτησία προσφέρει εύκολη πρόσβαση σε κορυφαίους προορισμούς της πόλης. Οι εγκαταστάσεις και οι υπηρεσίες που παρέχει το Lamurr Sukhumvit 41 Hostel διασφαλίζουν την ευχάριστη διαμονή των πελατών. Η ιδιοκτησία παρέχει δωρεάν WiFi σε όλα τα δωμάτια, ημερήσιος καθαρισμός, 24ωρη φύλαξη, υπηρεσία ταξί, 24ωρη ρεσεψιόν, φροντίζοντας για τη μέγιστη δυνατή άνεση των επισκεπτών. Ελάτε σε ένα από τα 6 φιλόξενα δωμάτια και ξεφύγετε από τα άγχη της ημέρας με μια ευρεία γκάμα ανέσεων, όπως ασύρματη σύνδεση internet (δωρεάν), δωμάτια για μη καπνίζοντες, κλιματισμός, γραφείο, μπαλκόνι/αίθριο, που θα βρείτε σε ορισμένα από αυτά. Εξάλλου, το ξενοδοχείο διοργανώνει πολλά ψυχαγωγικά δρώμενα έτσι ώστε να έχετε πολλά πράγματα να κάνετε κατά τη διαμονή σας. Όποιος κι αν είναι ο σκοπός της επίσκεψης σας, το Lamurr Sukhumvit 41 Hostel είναι μια εξαιρετική επιλογή για την διαμονή σας στη Μπανγκόκ. Always friendly, always relaxed here. Good location located in quiet soi off Sukumvit. Tops Supermarket very close. Also BTS Phrom Pong skytrain close and convenient. Hot shower is clean with soap and shampoo dispensor provided. Have filtered hot and cold water in kitchen all day convenient for beverage or soup. Breakfast in morning. Everything you need for comfortable stay. Refrigerator gets full when hostel gets full. 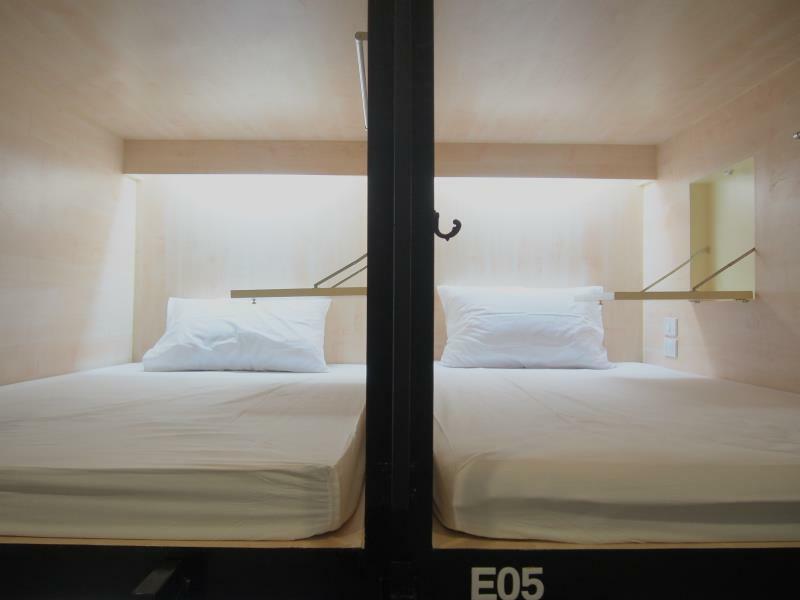 This hostel has quiet hours so you can relax at night. As a solo traveler, I stay here alot. I stayed several days at this Hostel and I was together with several other people in my dorm room. Every one of us agreed that it was freezing at night in the room so we asked the Hostel if they could do something about it (they don't give you the remote to adjust yourself). I personally asked multiple time. Each time they would come and do something about it and then come back 15 min later and put it back on freezing. I felt very bad. There was an older man in the dorm, he was cold and he was coughing. Every one said it was way too cold. This doesn't make sens. Near to BTS station, nearby Tops market. The shared toilet is clean. I stayed in a 4 bedded mixed room, the common area can allocate one luggage, however there’s spacious locker under the bed to keep your luggage and personal items, practically designed! Don’t stay here if you only want to see temples around Khao San Road, as this is remote from there and the sky train has not reached the old down town of Bangkok yet. For clubbing at Sukhumvit this is excellent or for a short layover with connecting flights, as it is really close to BTS sky train and thus the Bangkok airports. Staff is nice, breakfast is OK and the rooms small but tidy with plenty of personal locker storage. Do not hesitate booking this place. LaMurr is truly a gem in Bangkok. Ness and Sti at the front desk are AMAZING, and housekeeping always greeted me with a smile. Excellent location! Central to everything. Literally 5 min walk from Phrom Phong BTS station, TOPS Market steps away for food & snacks. Oh, and the boujee EmQuartier if you want some good food and upscale shopping. (food court in the basement & restaurants at the top are YUMMY!) I extended my stay because I felt very comfy, and loved the chill vibe there. What are you waiting for... just book it! This is my 2nd staying here. Helpful staffs, bed & every where is clean & tidy. Good location, just 5 mins to BTS. It located inside the traffic road, so silent at all. I like it & will come back again. Good location; close to BTS station, neat & clean, friendly & helpful staff, good to provide simple breakfast to residents The sleeping area is cosy. It would be better if a towel can be provided to residents. Besides, the sliding curtain should be of darker colour/tougher material. This place is very well located in commercial centric bussiness area in Bangkok, very close to Skytrain Station Phrom Phong, Sukhumvit area. They keep common areas clean (restrooms, kitchen, living room), simple but decent breakfast. Besides, there are many restaurants around. Very kind helpful staff, over all Ploi (don’t know if it’s written the right way), I did an early check out to have more time to explore the area, she kept an eye on my luggage and helped me to get reliable taxi. In few words, place is a bit tiny, but still good enough! Comfy bed, with see through curtain locker under the bed. lovely staffs, owners are nice. Good WiFi near bts phrompong station. it is convenient .. if you will have things to do around in sukhumvid Area Overalls are nice, not that high cost pet night compare as another hostels in the sane area and how comfortable you will be from here .. I would go back to stay here again if I have things to do in sukhumvid area. - No enough bathrooms and quit small. This is not a party hostel. Recommend Khao San Road if your looking for intoxication. 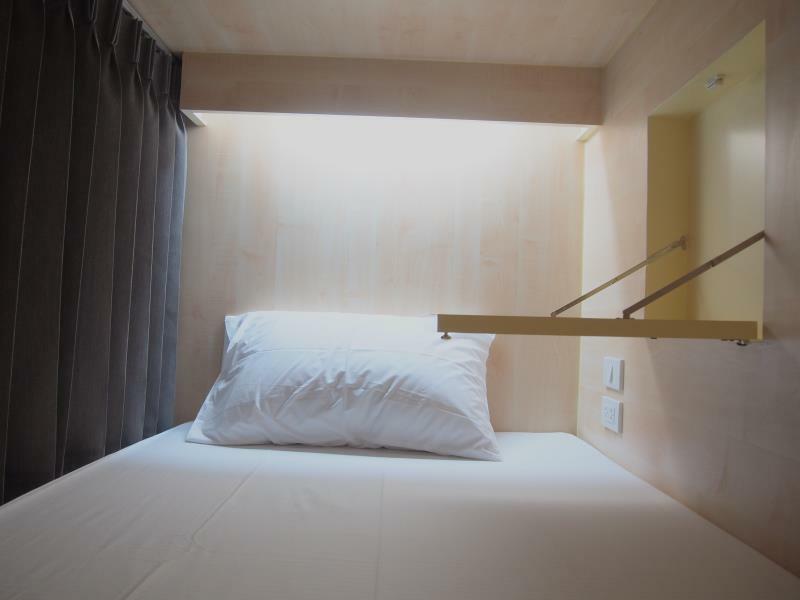 I can almost guarantee there will not be one wrinkle in your bed sheets :)This is a modern clean hostel which is in a secure, easy access area to Bangkok via BTS Skytrain. Breakfast is Coffee, Tea, Milo, Cereal, and fruit. Coffee and Tea always provided with a few snacks if you like.. TV with satellite in common area... Decent WIFI most of the time.. I stayed here a couple nights in Bangkok. I chose the location thinking there might be a bit more to do in the area but it was fairly quiet. Other than location (you can always jump on the sky train right there) it was a very clean place. I ended up staying in a private cube on a room with no one else so it was almost like having my own room. The beds are clean and they provided nice down comforters. 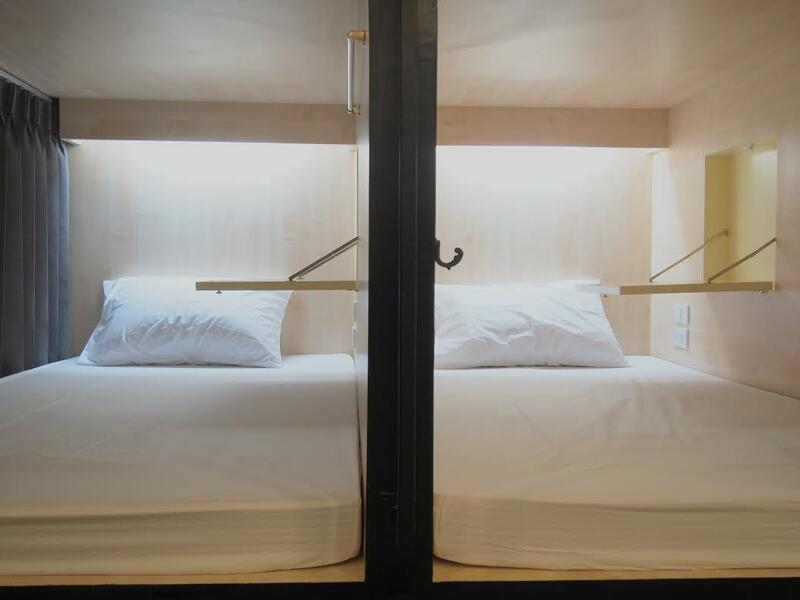 There are large lockers under the beds with keys provided. Bathrooms are VERY nice and the staff very friendly. I loved this place for a quiet escape just outside the city center yet close enough to get near the action. Loved staying here. I love this place. just by the staff alone this hostel is worth stay at. They seem to have just he right amount of room for the rather small and cosy building. I never felt like I was bumping into please. Nice location, nice and quiet street. clean and spacious room/bed. laundry service in house, attentive staff. I will definitely come back. You sure not to be disappointed. These are the most comfortable beds I've ever found at a hostel. They are big enough for a tall person too, which was a welcome surprise. The area is great for exploring the city and there's lots of good food nearby. I will come back next time! 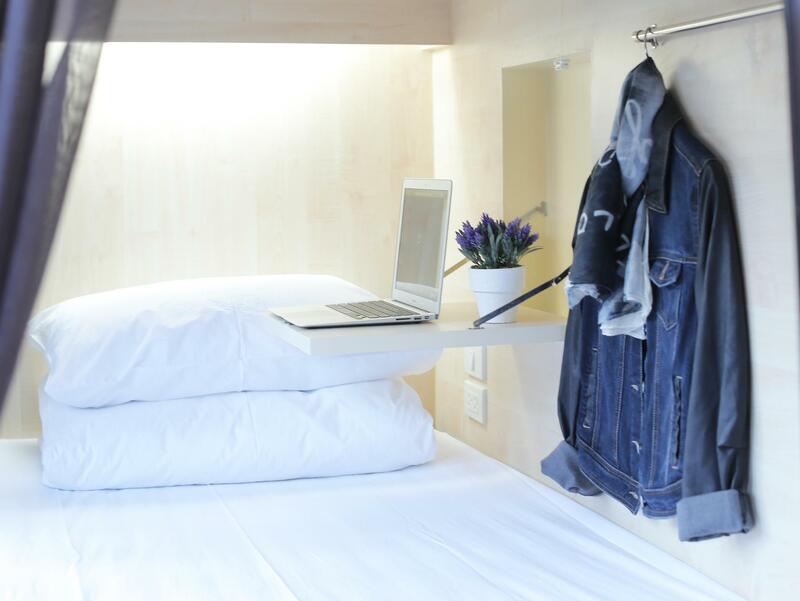 Nearest BTS station to this hostel is Phrom Phong BTS (just 3-4mins walking distance). This hostel is at the back alley of Miracle Mall, so if you are taking taxi over to this hostel, look out for Miracle Mall. This hostel is in between of Emquartier mall and The Commons (for eatery place). Bed is decent and clean, just comfy to have a good rest after long day outing in the city. Although the curtain to the bed is a lil bit transparent, that didn't really bother me much when the light turn off, you'll have your privacy (when the room light lit off). Bathroom area is clean and cosy for you to do your 'business' and have good shower. Washing machine and dryer is available in the hostel, but instead of doing it alone, the staff will help you do the laundry at a fee of 100thb (based on one load of your laundry). p/s : This may change though depending on their hostel management discretion. The common area that has biscuits and water dispenser won't leave you hungry in case you feel hungry in the middle of the night. Besides, you can bring your munchies you bought from 7-eleven or family mart over and have ur instant noodles at the common area. Staff is friendly as well. Clean quiet trendy hostel just outside the "loud" part of Sukhumvit. 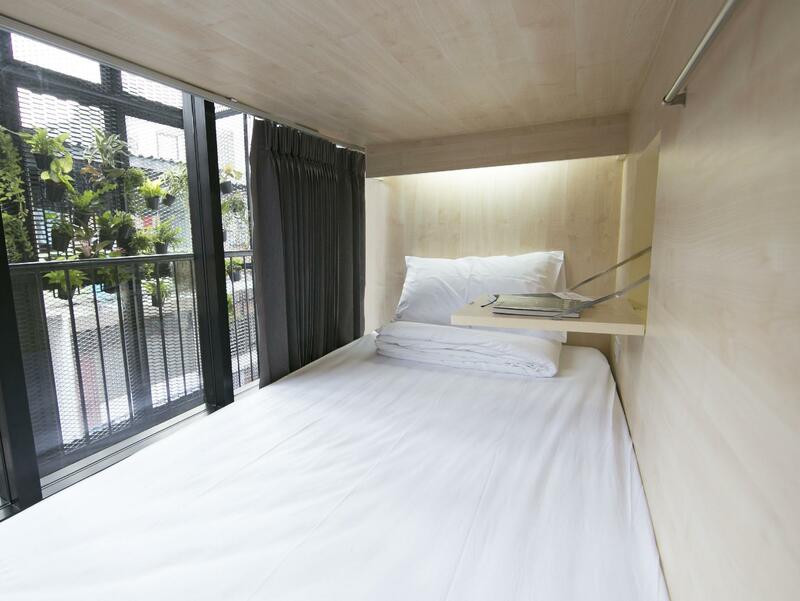 If your looking for a clean quiet modern hostel with a comfortable bed, this is an excellent choice. WIFI is excellent. TOPS supermarket close by. Their is a trendy mall with a gourmet supermarket and a french bakery close by which was awesome. You can buy a day pass at the BTS skytrain station close by for 140 baht(4 dollars) which allows you to travel around the city fast and see alot without the traffic. The place is clean and near to a metro station. The staff and facilities are good. As such the stay is very good. However the nearby metro station does not have an escalator and the taxi drivers in general are dishonest. As such, it may be challenging for travelers with huge luggages. Σταθμός BTS Phrom Phong στα 0.29 χλμ.